Jeannette Martínez Val is a Genetics graduate by the Autonomous University of Barcelona (2014), where she was awarded with the Extraordinary Graduation Price to the most outstanding student. She enjoyed an Erasmus Grant at University of Florence (Italy, 2014). She has also done an internship at the Galician Public Foundation for Genomic Medicine, under Prof. Ángel Carracedo supervision. She has studied a master in Biomedical Research at the University of Santiago de Compostela, carrying out the master project in the Stem cells in cancer and aging group, directed by Dr. Manuel Collado, at the Health Research Institute of Santiago de Compostela. 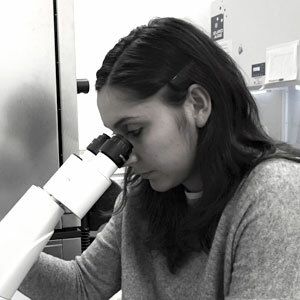 Now she is researching about cancer and metastasis using CRISPR/Cas9 technologies and Zebrafish in vivo model, as a PhD student (Molecular Medicine) at the University of Santiago de Compostela, supervised by Prof. Laura Sánchez. Recently, she has been awarded a PhD student grant from the Education Department of Xunta de Galicia.